In the past 23 years of our marriage, Sarojini has not only been my wife but my best friend and my greatest support. We’ve made it out of the worst times together and laughed through the best. My faith and her willpower have brought us this far. Even when she was first diagnosed with cancer in 2014, her positivity wasn’t shaken. After her treatment, I thought the worst was behind us. I thought my wife was finally healthy. But I was wrong. Her cancer is back now, worse than ever and the only thing that can save her is much more than what I can afford after years of medical expenses. 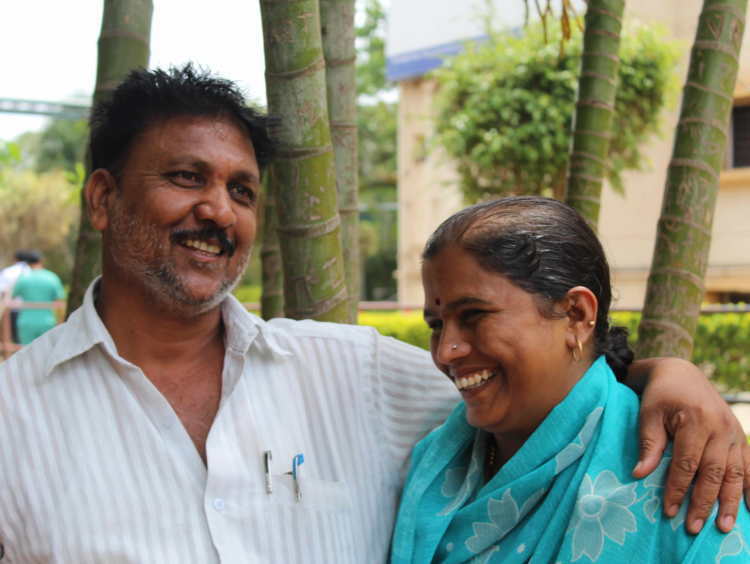 Four years ago, our happy, content life changed forever when we found out that Sarojini has blood cancer. We decided together that no matter how difficult it might be, we would tell our four children the truth. When we told them that their mother has cancer, they were shocked and upset, but they told her that they would do everything to make sure she’s alright. That’s a testament to how well Sarojini has brought them up. They are strong and fearless, just like her. 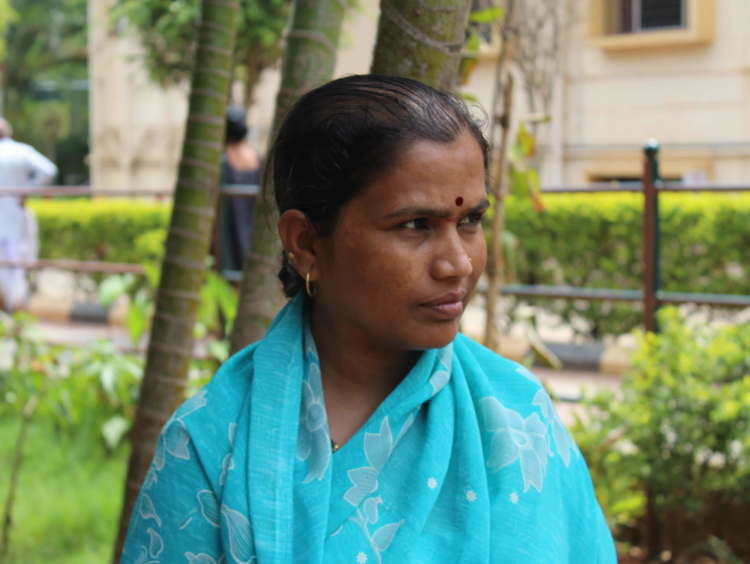 After a year of gruelling chemotherapy, Sarojini returned to our home in Bijapur. Except for the hospital checkups, things slowly went back to normal. The side-effects of chemotherapy slowly started wearing out and Sarojini regained her strength. Just when she was back on her feet again, her cancer relapsed in 2016. This time, Sarojini thought it would be her last fight. But we put everything on the line to make sure she gets the right treatment. She made it out of that too. 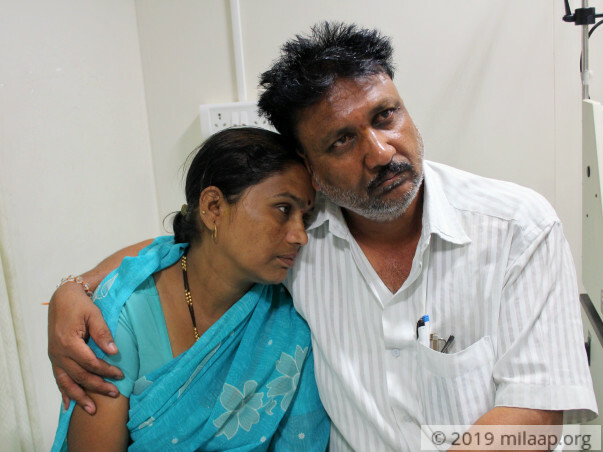 Through everything, all Sarojini said is that no matter what happens to her, our children’s future and life should not be ruined by her cancer. She doesn’t just put up a brave front to keep us happy, she is brave. Last month we found out that her cancer is back for the third time. This would’ve broken even the strongest of people, but all she said is that she will fight till she is able and alive. However, this time, I’m afraid I might let her down. 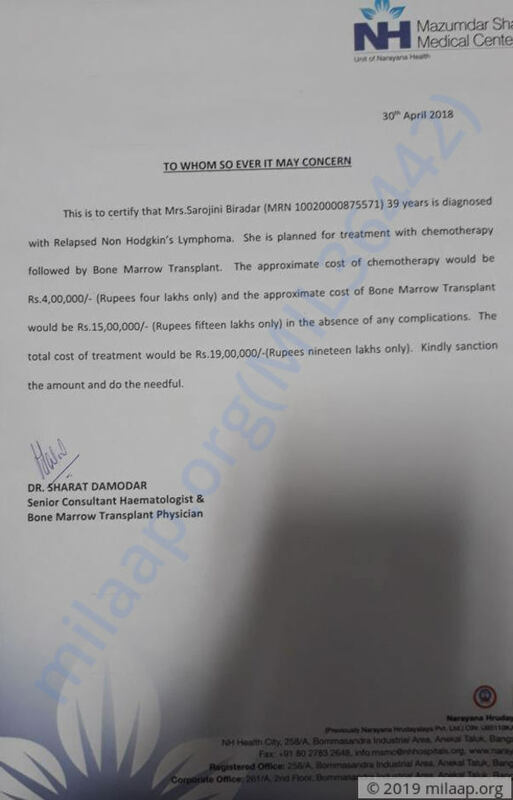 I’ve spent nearly 25 lakhs on her treatment in these past few years. We’re neck deep in debts and I’ve used all my savings, but now I’m staring at a dead end. I have nowhere to go for help. I’m only a daily wage labourer and hardly earn Rs. 300 on a good day. Sarojini needs chemotherapy and a bone marrow transplant to finally beat cancer once and for all. She beat it twice before, she can do it again. The only thing standing in the way is our poverty. 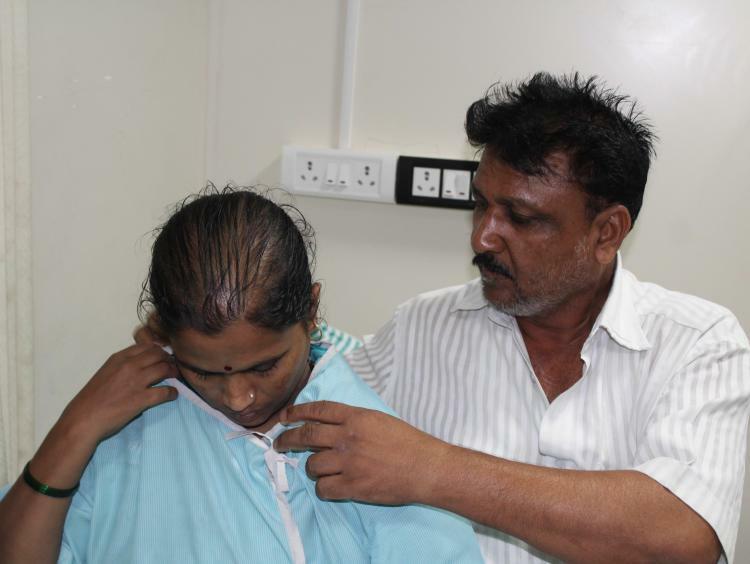 This is Sarojini’s last chance to live. A bone marrow transplant is the only cure for her now, there’s no other alternative. I’m desperate to save my wife. We haven’t even started treatment because we have no money left. 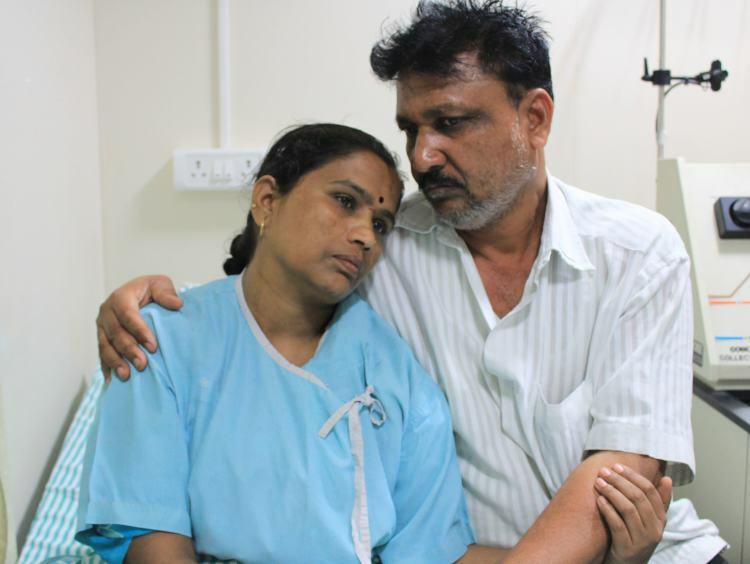 My wife needs 19 lakhs to get the treatment that can save her life and only you can help her through this. 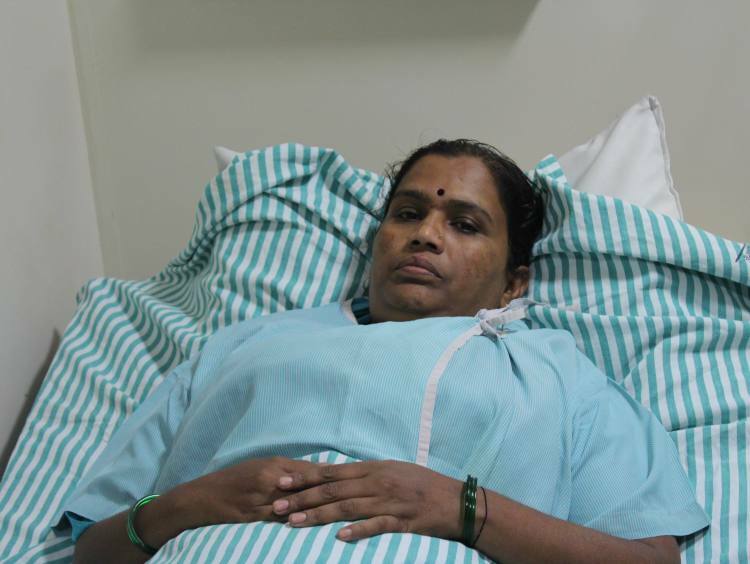 Your support will save Sarojini’s life. Thank you for the support you have shown towards Sarojini so far. Sarojini has started her chemotherapy sessions. She is still undergoing the treatment post which doctors will run tests to check her response to the treatment. We will keep you posted on her progress.